Starting a business on a shoestring? Looking for ways to stretch your small business marketing budget? 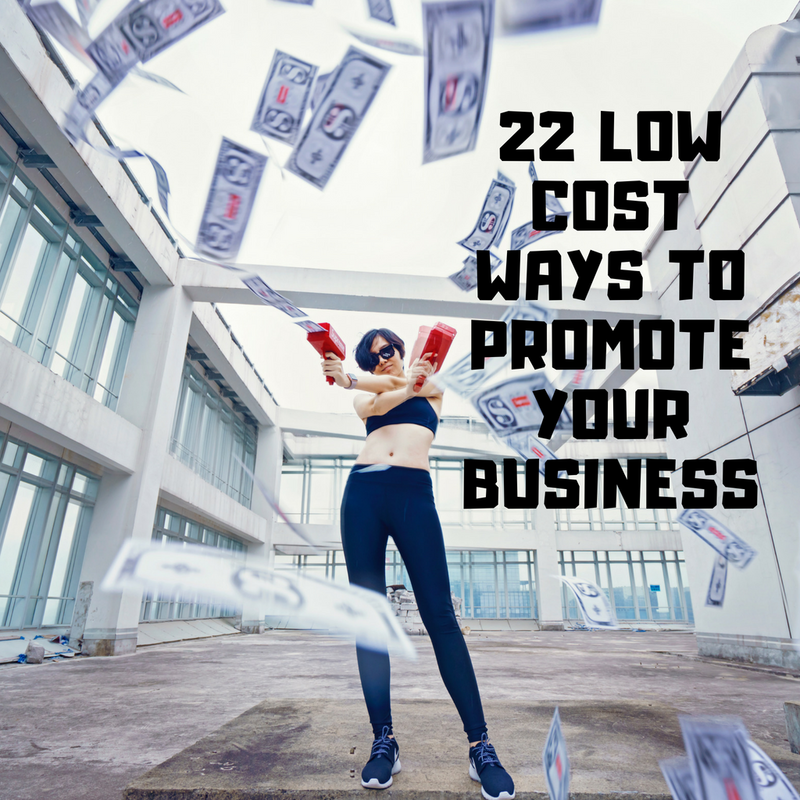 I’ve compiled a list of 22 low-cost ways to promote your business, why 22, I wrote a list of what I consider to be the most cost-effective and easiest ways to market a local business and there happened to be 22 so I went with it. Promoting a business is an ongoing challenge, but with these proven strategies you can find new customers without breaking the bank. 1. Plan — Write a profile of who your potential customers are, then decide where you’ll reach them. This will depend on what kind of business you have do you sell items from a high street shop or do you have a service based business, think about your existing customers and the new customers you’d like to attract. Will you find them on Facebook, Twitter or any of the other social media platforms? Would it be a good idea to post an ad to buy and sell groups online? For local businesses, posters and flyers in your target area can still work well. Have a think about it come up with a plan them implement it you can save a lot of time and money by planning your marketing campaign based around a customer profile. 2. Word of Mouth — A personal recommendation is the number one marketing tool. And the best part is it’s free! If you provide an excellent product and great customer service people will recommend you to their friends. a good reputation goes a long way with a local business or any business for that matter. 3. Create a Website — Online and offline work together, even small retailers will benefit from having an e-commerce platform. People check businesses out online before they visit them, even If it’s only to check opening times and your location. Having a good working website serves as an information source, promotes your business and helps to makes sales and bookings. If your current site isn’t working well or is too hard to navigate think about having it revamped, a dodgy website is a big turn off to potential customers. 4. Testimonials — Ask satisfied customers for testimonials and publish them on your website, these will serve as social proof to anyone who sees them adding credibility to your business. 5. Use a Blog to Attract Potential Customers — Having a blog as part of your website is a great way to attract potential customers, whatever your product or service is writing helpful and promotional blog posts, then adding them to your website and social media channels will engage with potential customers and get you noticed. It is also the best way to improve your rankings with search engines such as Google and Bing. 6. Add Your Business to Online Directories — Set up a listing for your business in search engine local directories. Google and Bing both offer a free listing for local businesses. To get listed on Google, go to Google My Business. To get listed on Bing, go to Bing Places for Business. Yahoo charges for local listings, but you get listed on a lot more than Yahoo if you buy their service. The service, called Yahoo Localworks, costs $29.99 a month and lists you in 50 directories including Yahoo Local, Yelp, WhitePages, Bing, Mapquest and more. The benefit of paying: You have a single location to enter your data to make it consistent and available on multiple online directories that your customers might search to find what you sell. 7. Tell Everyone What You Do / Elevator Pitch — Even if you don’t realise it you’re always selling something. Whether it’s an idea your pitching to a friend or your product or service your talking to a potential customer about. Your marketing all the time so why not be good at it. Research shows the average attention span of an adult is about six to eight seconds. If you get them interested, you have about a minute to pitch your product or service. Practice your elevator pitch. An elevator pitch is so called because all you have is the time between floors in an elevator to pitch your idea before your prospect gets out. 8. Give Several Business Cards to Your Customers if You Are a Service Provider — Let your customers promote your business for you, a satisfied customer will be more than happy to take your business cards and pass them out to their friends. 9. Attend Meetings of Professional Groups — The Chamber of Commerce, other local business groups, or civic associations. Have your business cards ready and get chatting, don’t give people the hard sell just ask them what they do take their card and give them yours. If they can’t use your service maybe they have a friend who could and vice versa. 10. Coupons — A coupon is something you give to customers to encourage repeat business. It could be for a free item or a discounted one. For example, You can give them 15% off their next meal or a buy one, get one free. 11. Frequency Cards — These encourage your customers to come back time after time for the reward at the end. Coffee shops use them a lot, where after buying several coffees you get a free drink. They can be used by any type of business that has repeat usage. From hairdressers to garages. 15. Create a YouTube Channel — If you can make informative videos that people enjoy watching, you can promote your business and gain new customers. Again check YouTube out, there are videos on there that show you how to do this. 16. Flyers — Old school but they still work. Flyers are a great way to let people know about your business especially locally, you can walk into the places you’d like to target. 17. Build Relationships — it’s cheaper to keep a customer than it is to get a new one. That’s why building relationships with your customers is important, you can do this through excellent customer service if two businesses sell similar products of a similar price but business A has friendly approachable staff who are happy to help, while business B employs staff who seem like they can’t be bothered with customer queries, where would you rather go? Email marketing is a must for any business with an online presence, you can collect email addresses on your website then stay in touch with your customers via regular newsletters and special offers, building relationships and loyalty. 18. Customer Reviews — Having positive reviews makes your business look trustworthy. If someone is looking for a local restaurant they will go for the one with the best reviews. This is true for any business people check reviews before they buy from or visit a business location. 19. Run a Contest — The prize for entering the contest should be relevant to your business so that you’ll attract potential customers who are interested in your products or services. To enter the contest people have to give their email address so they can be contacted if they win. Of course, everyone is notified on entering that they will be added to your email list and will receive newsletters and offers from you, this way everything is above board. Running a contest in the right way is a great way to build a large email list of potential customers, who are interested in what you have to offer. 20. Offer a Money Back Guarantee — Offering a money back guarantee gives your customers the confidence that should something not be to their satisfaction they won’t lose out, making them more likely to buy from you. 21. Keep in Touch With Customers — Staying in touch with your current customers and keeping them up to date with your products, services and any special offers that you have going on is easier and more cost-effective than finding new customers. 22. Email Marketing — You can use online marketing to boost offline sales. Ask customers to sign up for your email list, you can do this in store at the checkout and on your website, offer them something for signing up it could be a regular newsletter that includes special deals, news of your new products or services and discount vouchers, create special buying opportunities on certain days for your most loyal customers. While social media marketing can offer a good R.O.I when done properly. The different platforms can fluctuate in popularity and have been known to change their rules for businesses that advertise with them quite drastically. With email marketing, you have your own direct line to your customers that you can use to establish long-term reciprocal relationships. Email marketing is the tried and true digital marketing channel with an average return of $38 for every $1 spent. (source: constant contact blog). These low-cost marketing strategies will help you get in front of your target audience and gain new customers while keeping and building relationships with your existing ones. But it is important to remember that no matter how good your marketing strategies are, providing a good product or service at a fair price along with great customer service is the best way to build a long-term sustainable business.